Shop Talk: Volume 3 - Millennial Shop Owners. Young, energetic and committed to becoming great leaders. 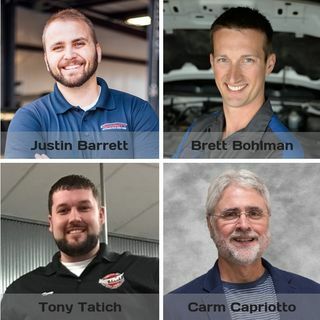 The panel consists of Justin Barrett of Barrett Automotive, Cornelia GA, Brett Bohlman of HWY 7 Service Center, Newel, IA, and Tony Tatich from TMT Complete Auto Service Center in Bremen, IN. Listen to these great young professionals discuss their current challenges and the advantages and disadvantages of being a young leader. This episode also addresses how maintaining a shop culture, ... See More hiring people that complements that culture, building relationships with customers and offering a unique experience.